Home A-Author Nobody can Hurt you without…. Nobody can Hurt you without…. 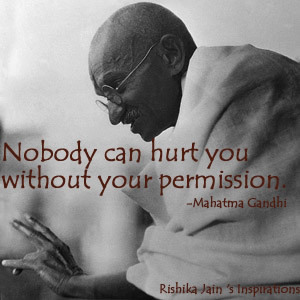 Nobody can hurt you without your permission. 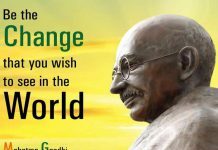 ~ Mahatma Gandhi. On the first day, as President, Abraham Lincoln began to give his inaugural address, just in the middle, one man stood up. He was a rich aristocrat. He said, “Mr. Lincoln, you should not forget that your father used to make shoes for my family”. And the whole senate laughed; they thought they had made fun of Abraham Lincoln. But Lincoln – and that type of people are made of a totally different mettle. Lincoln stared at the man and said, “Sir I know that my father used to make shoes in your house for your family, and there will be many other here… because the way he made shoes; nobody else can. He was a creator. His shoes were not just shoes, he put his whole soul in it. I want to ask you, have you any complaint? Because I know how to make shoes myself; if you have any complaint I can make another pair of shoes. But as far as I know, nobody has ever complained about my father’s shoes. He was genius, a great creator and I am proud of my father”. 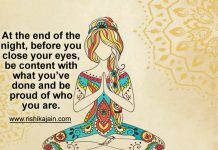 Previous articleAll Seasons are Beautiful for…..
Next articleMaintain Positive Thoughts Because…. Yes please I would like to get this inspirational emails each day. Nice quotes with nice touch of snaps.